Groupy – successfully used in various areas of group tourism – was further developed again last year and adapted to the special needs of loud, large, complex production facilities and (industrial) companies. GroupyCompany, the unique, dual audio transmission system is now available for „behind-the-scenes adventure tours“ in companies! You are an innovative or traditional, modern or down-to-earth company and want to open the door for visitors in an exciting adventure tour and allow a look behind the scenes? GroupyCompany is your perfect companion! GroupyCompany enables to hold tours at the perfect volume – even in noisy environments. You can protect your voice whilst ensuring optimal communication during an adventure tour through your company. GroupyCompany not only provides live audio tours with a guide, but also caters to international guests. Due to the dual function, previously saved content can be transferred to the device in any number of languages and played back using the audio guide function. On the one hand, this can be done by individual numbering and selection (as usual in a museum) – on the other hand, this selection can also be done by the controller tag of the speaker – simultaneously for all visitors. 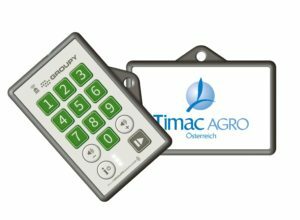 Timac Agro is one of the first companies using GroupyCompany! As a special bonus, the dual function of the GroupyCompany can serve several languages simultaneously within one tour. For example, a guide welcomes the participants of the tour via live stream and asks them to select the respective voice channel by number selection (eg 1 for DE, 2 for EN, 3 for IT, etc. – the language code is freely configurable). At the respective positions during the tour, the ready-made and stored content can be started at once via the controller tag and is automatically played in the previously selected language to all visitors. 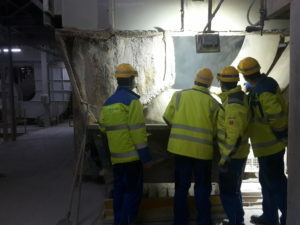 Thus, you offer your international guests a very special highlight at factory tours or company tours – through the efficient use of one and the same device. GroupyCompany is compact, light in weight and easy to use with intuitive key symbolism. The recording of devices with content can be done easily via Groupy software by the company itself. The Groupy system comes with a smart case which provides a charging station, transport and transfer solution at once. Easy charging, configuration and data synchronization for up to 56 devices per case is therefore guaranteed. In order to support your company and to emphasize your individuality best possible, extensive branding options are available. Printing your company name/logo on the removable card on the front of the Groupy devices is just as possible as the individual design of the lanyards. We consider ourselves as a reliable partner to our customers and therefore offer (in addition to the extensive branding options) also flexible operating models and exciting additional features – tailored to your individual needs. More about GroupyCompany soon to come!